Hello lovely readers, it's officially the summer holidays here in the UK! After graduating I thought that I would never have a summer holiday again but things change and now that I'm going back to uni in September to do a Masters (more on that in an upcoming post- watch this space) I have the summer to relax before I'm thrown back into the world of academia. 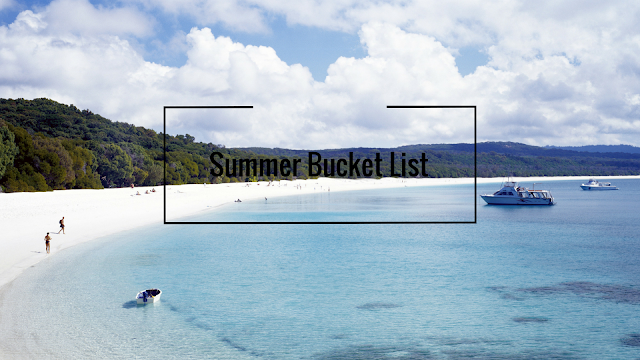 So I've created a Bucket List for this summer. 1.Walk barefoot on the beach at night. 2. Pick wildflowers (and use them for decoration and artwork). 3. Go to a fair. 5. Read in the sun (as much as I can because as we all know British summers are temperamental). 7. Go dancing with my girls (I can't remember the last time I went out dancing with my friends and that makes me sad). 8. Go to a wildlife park. 9. Listen to live music (even if it's just in a pub). 10. Make an huge fruit salad (with loads of different kinds of amazing fruit that I don't get to eat that often). These are a few things that I want to do this summer. I hope you enjoyed this post, do you want to do any of these? What's on your Summer Bucket List? I know right? I'd love to do it! Ah that's true they can be quite annoying. You should definitely go to a fair they are so much fun. Thanks for dropping by! Thank you Kim hopefully I'll be able to do everything! I will email you tonight I have meant to email you for ages but everything has been so hectic recently. Thank you my absolutely wonderful friend I hope you are well and everything s going great for you!